Meant to mention that this week is officially Mystery Week in NYC, culminating tonight with the 65th Annual Edgar Awards Banquet. Read more at this link. I'm rooting for Steve Hamilton's book, THE LOCK ARTIST to win Best Novel. Link to the rest of the nominees. What is that cover? 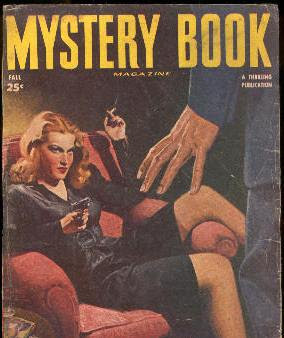 It reminds me of the days of Mickey Spillane books -- which I didn't read, but also reminds me of some of the Perry Mason covers, which I did read. I have only read three of the top contenders for best mystery, haven't read The Lock Artist, but plan on doing that. Congratulations! The Lock Artist did win the Edgar. And Huang's book on Charlie Chan won also. I see I have more to read. Kathy: Yes, I congratulated Steve on Facebook. It is a well deserved win. He's a fabulous writer. I am most especially fond of his Alex McKnight series and there's a new one coming out this year. Hooray! Can't wait. I am also thrilled for Professor Huang's win. The CHARLIE CHAN book was a terrific read. Yvette, I must read THE LOCK ARTIST. I had forgotten it. I always pay attention to a book that has the coveted Edgar Award. Dave: The truth is I normally don't pay that much attention unless I've read the book(s) nominated. This time out, I'd read two of them. A rarity. This is a very well-deserved win. And the non-fiction win as well. Professor Huang's book on the real Charlie Chan is terrific. I will put The Lock Artist on library reserve. I would like to read Huang's book, but I don't get to non-fiction too often. If I see it at the library, I will look at it. So much to read, so little time -- unless we could give up sleeping, cooking, eating, paying bills, etc. And that evil tv watching, which takes away from reading time, although I do both at the same time -- a family habit. And Rogue Island won for Best First Novel. I knew there was a reason I wanted to read that book. I was pulling for Huang's book to win Best Non-Fiction work. Very glad and so deserved. I voted for Huang's book it at Malice Domestic where I was this past weekend. But being a convention devoted to the modern "cozy" moreso than the traditional detective novel John Curran won Best Non-Fiction for his Agatha Christie Notebooks. Also at Malice, Louise Penny picked up her 4th consecutive Agatha for Best Novel (Bury Your Dead)- definitely putting her in the record books and once again firmly placing her in the contemporary crime fiction pantheon as the closest writer to Agatha Christie we have today. I don't know that Penny should be compared to Chrisite, her writing is so different, John. At least in my view. But maybe you mean in popularity? ROGUE ISLAND was terrific. I posted my review today. A wonderful debut, so self assured. Wow. Louise Penny definitely writes differently, but in the overall mood and construction of her plots she is very much in the Christie mode. While Penny will do more in depth character study and even veer into social commentary in telling her stories, the small Canadian village is plagued with crime similar to St. Mary Mead. The manner in which the crimes are committed and solved adheres to the fair play tenets of the Golden Age in a way that many contemporary writers absolutely cannot manage or don't want to bother with.